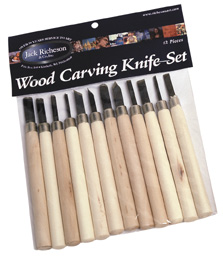 A 12 piece wood carving knife set which is perfect for students and artists in training. They are made from durable forged steel and mounted on 5-inch wooden handles. Wooden handles are designed to be easy to work with and durable. These are student grade wood carving knives which are great for basic carving purposes. They can be used to carve on a wide range of different surfaces. The blades do not need to be sharpened any more before use. 12 different shapes are included in this set. A versatile set of wood carving knives that offers a great starting point for a student. Madison Art Shop, in conjunction with Jack Richeson & Co., are proud to make available this economical set of wood carving tools. They are sure to be a great fit for any artist or project.